Patches never wanted Rusty to be part of our family. When he arrived, at the end of 2005, Patches ignored him and if he got too close, she would hiss and push him away – not too gently. Rusty was never put off for long. He was born friendly. Over these long years, it was evident to me that these two would never be close. This is for real. Not photoshopped! We’re a close family now. Finally. We all know that animals (even humans) have their familiar habits and routines which make us all feel comfortable. Rusty, of course, has his. Below are the 2 videos that make up our daily morning routine. Of course, I usually have to interrupt my breakfast to accommodate him. He can be bossy at times (all the time!). If I’m not quick enough, he lets me know about it!! But it’s worth it. It’s heartening to see that Rusty’s back legs are working better. But, when I can, I encourage him to walk down the steps near the loveseat; otherwise, I pick him up from wherever, and gently place him on the floor. For at least the next couple of weeks, I have to be careful about his jumping, even though he might want to do it. Not easy when you’re dealing with a cat. I mention “Down Pat” in the title. For his reward, he gets Pat-ted Down. This little kitten is very young – still has its baby blue eyes. It’s a Persian – adorable. And such a sweet voice. Dog, You Shall Not Pass Cat! The following video is one of the best I’ve seen, showing the cowardice of dogs to cats’ existence. Don’t get me wrong – I love dogs, too – I used to have dogs in my life as well as cats – a long time ago. Click and enjoy and laugh. Even with this space between them, they still kept a watch on the other! At opposite ends. Romeo and Patches seem to have reached an agreement on the couch. Confident should be his middle name! This photograph speaks for itself. Just look at that body language!! Very happy to reblog. Patches is so sweet. Patches is a very patient girl. So sweet. She really wanted to lay down in the spot where Rusty made himself comfortable. So, she decided to take up the space next to Rusty. As soon as she did, Rusty left the rug. I’m always surprised by their actions. One can never predict what they will do. That’s part of the allure of cats. They keep life interesting, for sure. She definitely is a queen. The cat tree with the “penthouse” at the top has been here since Patches was a small kitten. She has definitely “grown” into it. And, of course, it’s one of her favorite places to take her afternoon nap. I just received an order from Drs. Foster and Smith. 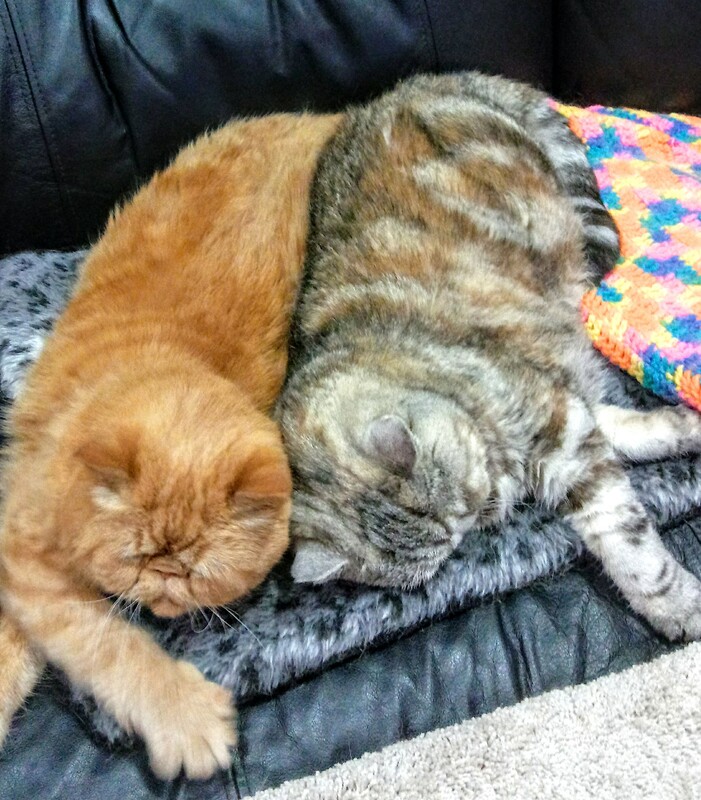 One of the items (I ordered 4 at half-price each) was special “cozy cushions.” I grew tired of using towels, etc., in my quest to keep as much cat fur off the couch as possible, and from turning my black couch, into a white couch! I spread the cushions out, hoping that Patches (as well as Romeo), would spread out comfortably on the cushions, and save Mom from so much vacuuming. When it comes to animals, things don’t always turn out the way you wanted.